I’ve always loved Tweetdeck. It’s been around for a long time now and has been through a lot of changes. Before the days of social media management I was a big advocate of Tweetdeck over alternatives like Hootsuite. But since we started running other people’s accounts and needing to send reports and update LinkedIn and Google+ Pages too, that’s changed slightly. Nevertheless, I still love Tweetdeck and we still use it as a tool for Twitter accounts. 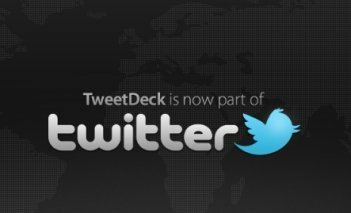 Tweetdeck was bought out by Twitter a while back and many of the purists could argue that this ruined it. For example, you can no longer update Facebook from Tweetdeck as Twitter shut down the API to any other network other than their own. But the best part of Tweetdeck for me was always how it presented Twitter – so I’m not bitter, and I’m still using it. 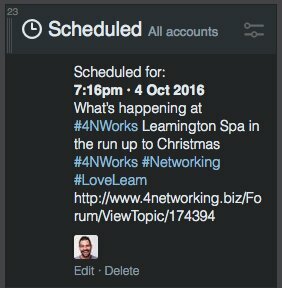 There’s more to Tweetdeck than just scheduling Tweets! We no longer use the scheduling feature in Tweetdeck as it’s clunky, time-consuming and started to fail us. The poor calendar scheduling pop-ups and other buggy problems got us irritated for a while. So we use Buffer for scheduling tweets now and you can read why that’s awesome here. So if we don’t schedule (the only thing most people do with Tweetdeck) what do we do? Here’s a suggestion based on our experience. Twitter.com (the official website) just doesn’t cut it for us. It’s now too “we’re copying Faceboook”. I’ve never liked it, and then they made it even less about the conversation and more about the design of it. Here’s the deal. Twitter is about conversation. Tweetdeck makes this happen far better. It streams better, it searches (and more importantly saves those searches) better than Twitter.com. The simple columns on Tweetdeck update in real time and the columns of different searches, hashtags, mentions and other areas of Twitter are there, right in front of your eyes. Twitter.com has one screen and you have to keep flicking around to see stuff. Mentions get missed, follows aren’t obvious and it’s not very social at all! You can’t even add a comment when you share someone else’s content as there’s no ‘Quote RT’ button. I spend all my desktop tweeting time on Tweetdeck. It’s a far better experience and as a social media manager it looks, feels and works better than the standard Twitter website. This is simple. If you’re a brand (even a small one) you should be searching and watching for mentions of your brand name on Twitter. To do this in Tweetdeck is simple. Go to the left hand side and type your brand name into the magnifying glass. Save that search and you have a column with tweets only mentioning your brand. You may want another column with different variations of your brand too. Take away: Watch your brand mentions – not everyone will use your @name or Twitter handle. As standard you’ll get a home timeline for your main account. This is the account that you logged in with or the account you’ve set to be the default account. This is the account that will be automatically set when you compose a new tweet. To change this (if you need to) just go to settings>account>click ‘make default’ next to your desired account. If you look after lots of accounts then your timelines will be different too because those accounts will follow lots of different people. To replicate this in Tweetdeck just add a home column for each account (add column>home>select account). Bingo. Now you have the home timeline for that account and can interact with all the tweeters that accounts follows. Takeaway: Have a home timeline per account for more focused interaction. Lists on Twitter are so underused. Clean up your timelime by adding the most important people into a list. Why not put all your customers into a list? Then you can pay them special attention and easily keep up with their activity on Twitter. You’ll need to create the list and add people to it in Twitter.com but you can add a column in Tweetdeck (add column>list>select the correct list) All your account’s lists will be there to chose from so it’s really simple! Takeaway: Have your lists as columns so you get a really clean stream to keep an eye on. Twitter is all about interaction. You’ll get retweets, follows, mentions and favourites. I like to know who’s giving me love on Twitter so I have an interactions column. It’s simple to add (add column>activity) and the all the greatness that you create is there to see. I like to follow back useful people who favourite and thank people who RT. This gives me a really simple way to do it as well as not letting them go unnoticed. Takeaway: Add an interaction column and show your gratitude to your Twitter fans. Hashtags on Twitter rock! I love a good hashtag and live events are awesome when they integrate Twitter with a conversation on a hashtag. Going to an event? Organising one? Maybe you have a company hashtag? Keep an eye on it by creating a hashtag column (add column>search>type your #hashtag>add column). I like to keep an eye on the variations of a hashtag too – so if there could be more than one way to type it, search for those. Takeaway: Track your hashtags by having a column just for them. Did you know that you can have just one tweeter in a column? Well you can. Just add a user column (add column>user) and you can see all the tweets from an account that you have linked to Tweetdeck. Maybe you have a competitor that you want to keep an eye on, or a favourite tweeter you want to access. Add a column with just their tweets in (add column>user>search for them in the search box above your other accounts). Now you have them in their own column to spy on and they won’t even know it. Takeway: Add a column for a specific user to keep their tweets in your view. I love blogging (I hope you like reading them too) and I like to share these blogs on Twitter. It’s a great way to get people to read them. But I’m not the only one who shares my blogs and that’s brilliant. I like to find the people who share my blogs but like the brand search, not everyone will @mention you when they do it. Simple solution. Add a search for your URL. To do this well just add a column with the root of your URL (add column>search>www.EXAMPLE.co.uk). By only adding the root, Tweetdeck will show every link shared from your website in this search – even if the links are shortened or in bit.ly links! Takeaway: add a column for your website’s domain so you can see all the shares of your website content, including blogs. Tweetdeck is so much more than scheduling – unleash the power! I love Tweetdeck even though I don’t even schedule from it anymore. Having the ability to organise your Twitter (and other accounts that age) make Tweetdeck a powerful tool and something that not everyone is using to its potential. I hope that you can use these powertips to power on through Twitter like a social media train of influence. Tweetdeck is customisable – what do you do with it? What’s your favourite column or hidden trick in Tweetdeck? Please share your tips in the comments below. I don’t tweet longer as I’m a Twitter purist. I like to get my point across in 140 characters as intended by the idea behind Twitter. I’ve not come across a way to do this on Twittedeck other than modifying the ‘Quote RT’ that you mentioned and changing RT to MT (modified tweet) and then I have space to add my comment. What I’d really like to know is: 1) what happened to “add to Tweetdeck” in Chrome browser’s right-click menum, and 2) how I can get it back — it’s absolutely a PAIN to not have it, I’ve gotten so used to it. Have you tried Buffer? It will do that for you and it the article to Buffer instead. It’s a superb tool and I use it for all my automation now. I’m new to tweeting (and honestly pretty new to the whole social marketing world for my business). I was happy to discover Tweetdeck for managing, and thrilled to read your post and finally ‘get it’! Thank you! I’m having trouble getting the answer to this though: how do I edit a scheduled tweet? I’ve spent the evening trying to find the answer. Thanks again for explain it all so well for this newbie. Thanks for your comment. I’m so pleased the blog helped. Create a column with ‘Scheduled tweets’ in. Now you can go to that column and edit/delete any scheduled posts! Nope. Because my schedule column only offers me DELETE, not EDIT. Where is EDIT hiding?? I also only see the Delete button. In my case, it is a tweet with a picture, if it makes a difference. What browser and machine are you using? My edit option is right next to my delete option right there in the colummn. I’m on Mac so not sure if it’s exactly the same? Maybe you need to update your version? If you’re still out there… I also don’t see an option to edit in my scheduled column. I’m at work using a windows computer. What would updating your version look like, as in how does one do that? If you have an image attached to a scheduled tweet, there doesn’t appear to be a way to edit the tweet in Tweetdeck. You just see DELETE. If there is no image attached, then you will see both EDIT and DELETE. You used to be able to go to ads.twitter.com to edit scheduled tweets with images, but that also no longer seems to be an option. Any other workarounds? Yes we noticed this too. I think it’s a bug as you used to be able to edit it. Frustrating! I’m trying to add a home column to my tweetdeck with a specific user but when I add home column and try to search for someone the search bar isn’t there. Can you help? Howdy. I think this is because you need to add the account first. Add an account from the bottom left an the ‘accounts’ tab and then when you add a ‘Home’ column the account should show up there. Hi Todd, I scheduled a tweet for this Monday and I need to change the image and the tweet. Who to I make a change to a scheduled tweet or find it to delete it. I have a scheduled column but it does not shoe up there. Is that where it is to be listed? Also when I created it there was not enter or schedule button to click… so I am not sure it was even entered? While I am at it, on another note, is there a way to do a masse tweet or re-tweet to groups of 20 or 30 people at the same time? Or do I have to enter them one at a time? Your help would be greatly appreciated. I am a newbie to TweetDeck and I have not done much tweeting! Thanks JerseyBoy! Tweets scheduled in Tweetdeck that have an image can’t be edited. It’s a big issue and something Twitter really need to sort. The online way is to delete and start again. If you scheduled it it will be in your scheduled column. So it sounds like it went out already. Go to your twitter and check your previously sent tweets to check. You can’t mass-tweet. Twitter hates that kinda stuff to be honest. The information share in this post is very useful. Thanks for sharing such an informative post.